The unit features an Ecoflex dosing system with interchangeable dual detergent cartridges that are refillable with whatever brand of chemical the client prefers. The CS7010 is available in three versions – LPG-Hybrid, Diesel-Hybrid and ePower Battery – all with ecological credentials. The machines are said to feature reduced total cost of ownership. Nilfisk has replaced hydraulic systems with state-of-the-art electric drive technology. There are no large hydraulic reservoirs, filters, oil coolers and leak prone hydraulic hoses, pumps, motors and valves. Maintenance levels are reduced, with all brushes, brooms and squeegees able to be replaced without the use of tools. Additional design innovation provides for one-pass cleaning, keeping debris dry without introducing scrubbing solution into the debris hopper. The front dry sweeper hopper is corrosion proof and has a 285L capacity and high lift system. 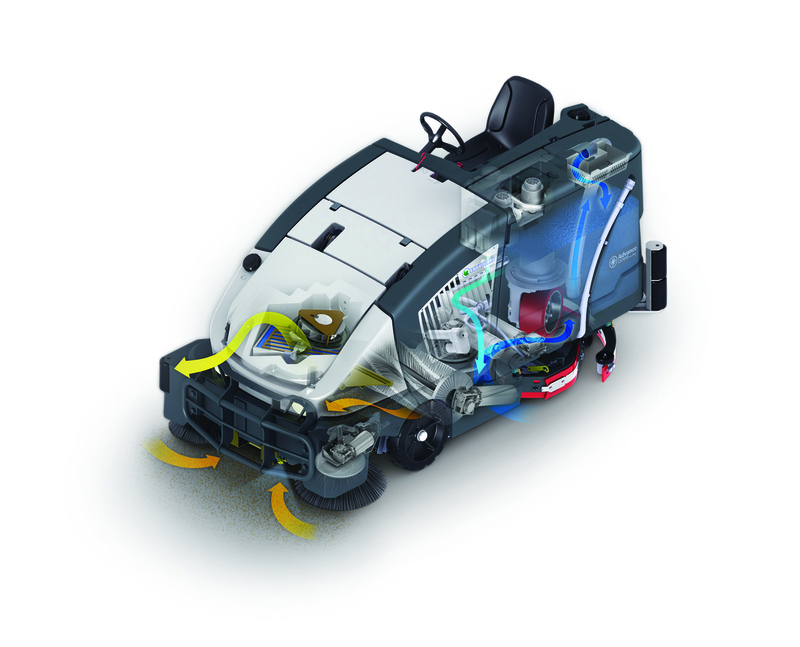 The CS7010 also benefits from DustGuard airborne dust suppression technology that minimises dust pollution at brush level. Productivity levels are critical for large area cleaning in warehouses and manufacturing plants. The CS7010 delivers 7756m2/h. The trademarked SmartFlow system automatically adjusts the solution flow according to the machines speed. Less water and chemicals are used as a result, increasing productivity with fewer dump and refill cycles.